When Stefan Höglmaier first stepped into the bunker on Ungererstrasse he found things “extremely oppressive”: Inside the massive concrete block that in the closing years of World War II offered around 700 Munich citizens protection against bombing raids, you were as good as hermetically sealed off from the outside world. What might have prompted most to flee spurred the 40-year-old project developer on to greater things, pressing all his creativity buttons – after all, he hates anything clichéd and off-the-peg solutions. So it was that what he saw in front of him at the intersection of two interstate ramps was not only an almost windowless block with an almost ghostly past potentially subject to some heritage regulations or other. Instead he spied a standalone in the direct vicinity of the English Garden that potentially offered an uncluttered panorama view. And he guessed that the sheer weight could spawn a sense of the sublime, the oppression a sense of safety. 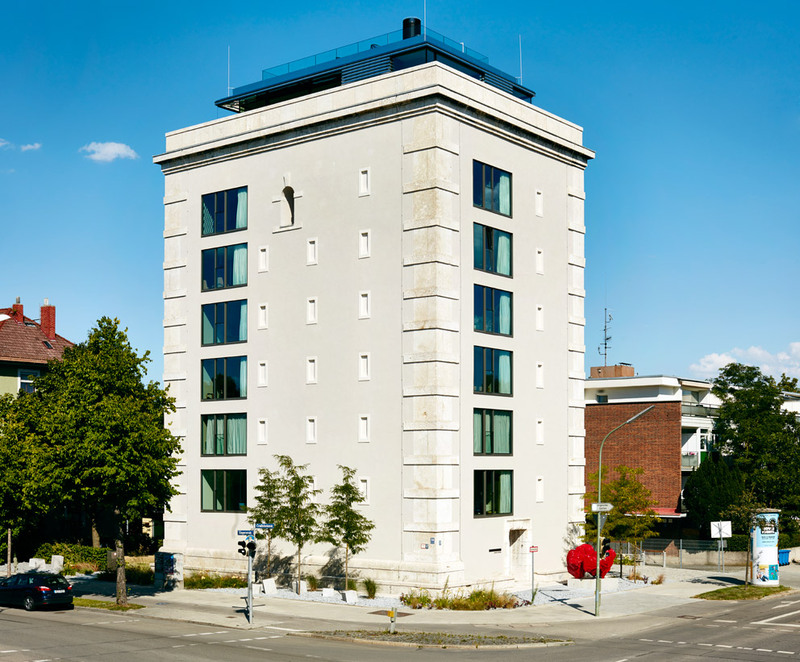 He acquired the bunker from the federal government as an investment for his company Euroboden and at the same time with his partner, Californian singer/songwriter Oscar Loya, decided to move in to the upper floors. The intrepid duo found an almost equally daring partner in the guise of their friend, architect Tim Sittmann-Haury of Starnberg’s Raumstation office. Over the next six months the latter had light-holes sawn out of the reinforced concrete – only one per cardinal point and story, but so spacious as to create loggia-like niches within the walls, which are two meters thick. The attic was then replaced, giving way to a glass penthouse. The couple’s apartment runs across three stories, and the idea of the “panorama view” has already been realized. 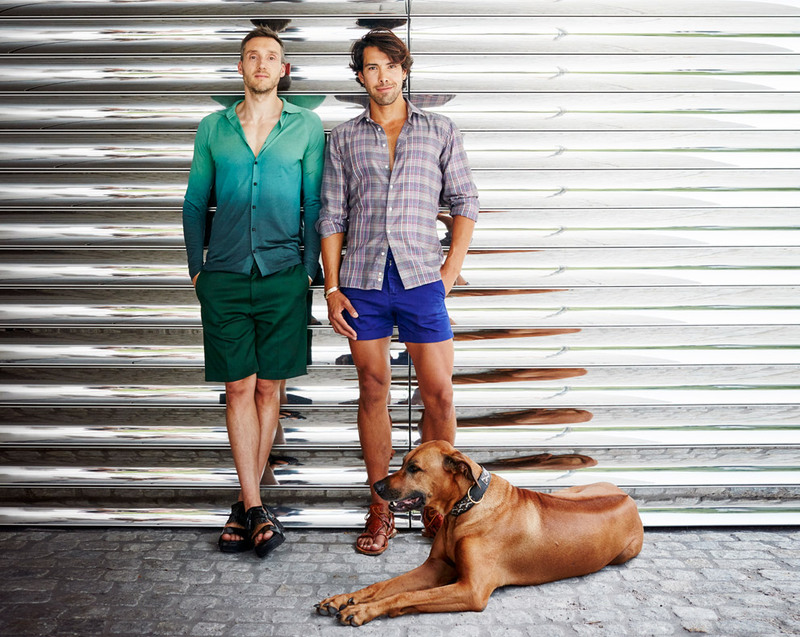 When designing the layout Höglmaier took to heart the advice he often gives his clients: “Always listen to your inner voice: How do I really live and what has what status?” For Loya and himself this basically hinged on the fact that both professionally and privately the two insist on sartorial perfection. The fourth story is therefore dominated by a walk-through XL closet that transitions into a bathroom that is just as large. By comparison, the ill-frequented kitchen next to the dining and lounge area on the top floor is tiny. And on the fifth story they decided against the gym originally planned – in favor of a music and media room – and now simply go to the fitness club across the road each morning, with the option of then cooling off in the nearby Eisbach river. As regards furnishings and outfitting, the couple agreed that they did not want to live in a “cool box”, as Loya puts it, some 400 square meters in size. There could be no talk of some barren loft aesthetic, among other things in order to not degrade the building’s history to some quoted style. “We didn’t want the spin to be an image that was as rough as possible, to act as if it had always been that way,” is how the architect puts it. Which does not mean that history gets completely obscured. Indeed, the stairwell has been cleaned up and restored, but its almost coarse character preserved. And in the apartments, after consultation with the heritage authority, Sittmann-Haury created “windows on the past” in the ceilings: Cables and wiring are located in the wrap-around cornices and you can see the marks in-between of the shuttering the workers used back in 1943 to mold the concrete. Sittmann-Haury relied on the services of young interior designer Regina Hoefter when it came to planning and realizing the interior. 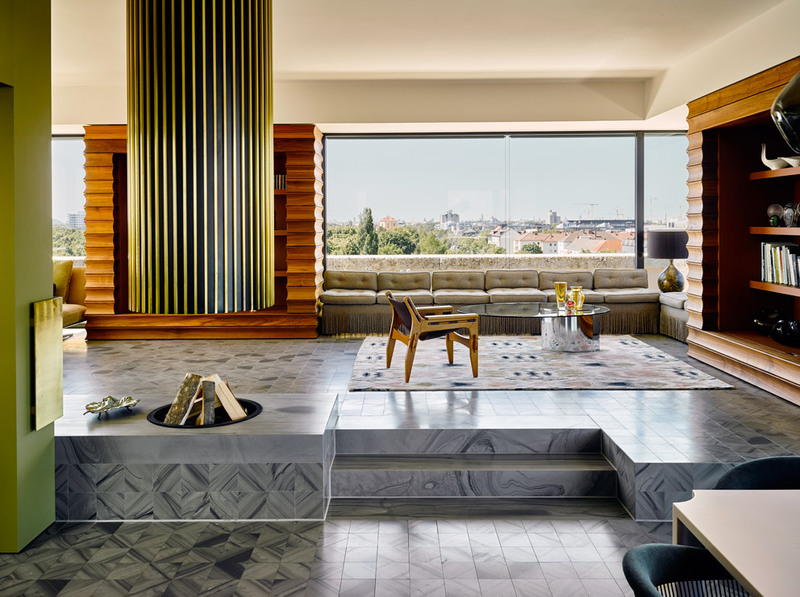 Although or perhaps precisely because the two clients’ ideals were not quite aligned – “I wanted everything to be pretty masculine, but Oscar prefers a bit more glamour” – the final result is an exciting symbiosis of opulent textiles and muted colors. Each of the three floors has its own motto: the music room was inspired by the melodramatic Hollywood Regency style; the closet, bathroom and bedroom by the Roaring Twenties; and the “party floor” at the very top by the Swinging Sixties. 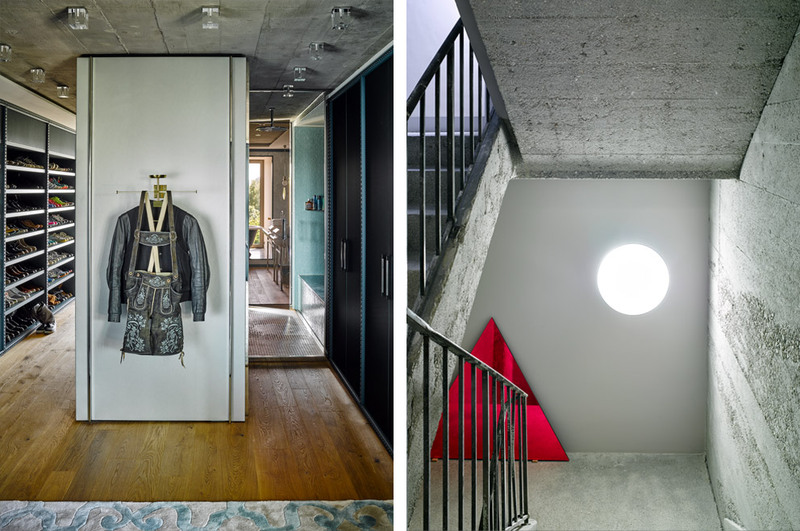 The staircase winds its way through two meters of concrete from the music room into the penthouse. 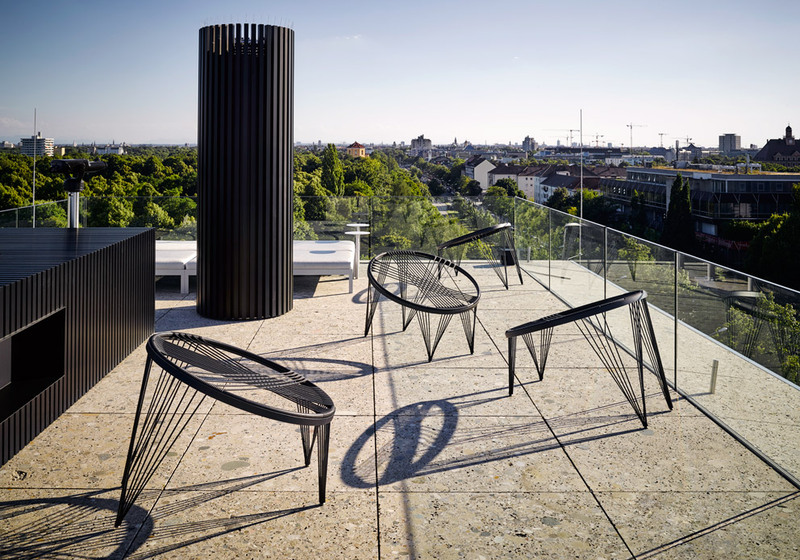 Loya and Höglmaier only kept a few furniture items from their former apartment, a loft in the district Gärtnerplatzviertel, and key items such as the black-and-white Roche Bobois divan or the Flexform couch in the penthouse are new additions. Then there were custom-made pieces, such as the bed headboard, which emulates the graphic texture of the wallpaper. On a trip to Paris the team rounded out the interior – with vintages. There’s a clear principle behind the selection. The purchases are all items that the architect, the interior designer and the two masters of the house raved about and agreed on – even if this was “sometimes pretty frustrating, as even the 17th candelabra didn’t make the cut, getting only a 3:1 vote,” Sittmann-Haury recollects with a smile. The system also proved to be a reliable approach when compiling the materials. “There were no taboos, the two clients were open to all suggestions,” comments Regina Hoefter. The kitchen boasts brass, along with stainless steel and linoleum, there’s cement plaster in the window niches, along with hand-sewn curtains, and the range of fabrics runs from horsehair to silk. “Oscar studied fashion, he immersed himself completely in the choice of textiles,” Höglmaier recounts. Whereas he actually “only always chose the things that felt softest.” With plenty of fresh supplies keenly provided by textiles expert Hoyer & Kast, the group ultimately opted with a clean 4:0 for hand-printed clouds on the wall of the guest bathroom, heavy jacquard with an Inca design in the style of the highly exoticist Twenties for the bedroom and wide black-and-white block stripes for the bed belonging to Rhodesian Ridgeback Louis in the library – pure extravagance that fuses here into a refreshingly natural interior. There was only one moment of confusion, namely when the architect opened up the Corian color fan for the planned dining table and stopped at a delicate pastel pink. “That was a shock,” laughs Höglmaier. “But then I thought: No risk, no fun!” Their courage paid off, as usual, he adds in summary. He jumps up, disappears into the kitchen and returns carrying a large porcelain cup that he places at the center of the table. The pale pink undercoat makes the white glow beautifully. “Pretty smart, huh?” We can only agree. 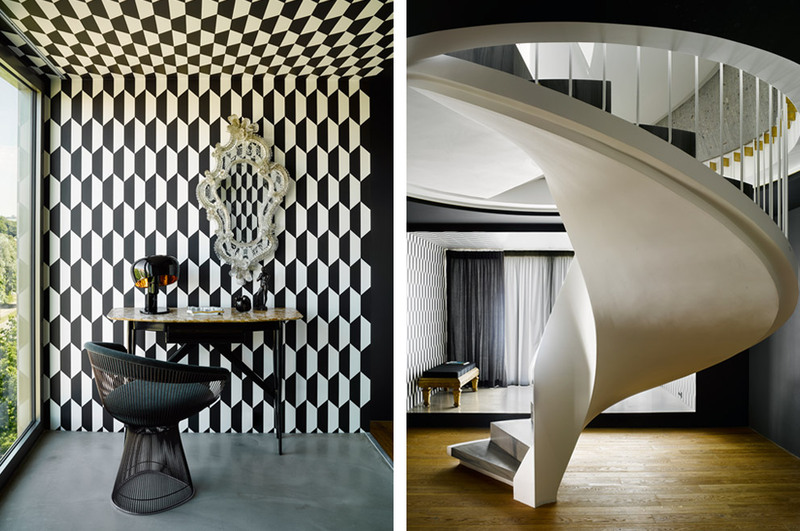 “Oscar and I have never put so much passion into designing an interior as in this apartment.”, explaines Stefan Höglmaier. A watercolor by Rainer Fetting hangs above the Glas Italia bedside table, glass luminaires by Lee Broom. “I love the fact that here I don’t feel at all like I am living in a reproduced cliché.”, says Stefan Höglmaier. “We didn’t want the end result to be as rough as possible to give the impression it was always like that HERE.”, eyplaines the architect Tim Sittmann-Haury. The colors of the Swinging Sixties style were gently subdued in the penthouse. When green tones started dominating, brass and the soft pink tones of the rug and customized Corian table (right) helped. Fitted furniture by Holzrausch takes up the lamellar structure of the chrome-plated roof girders. 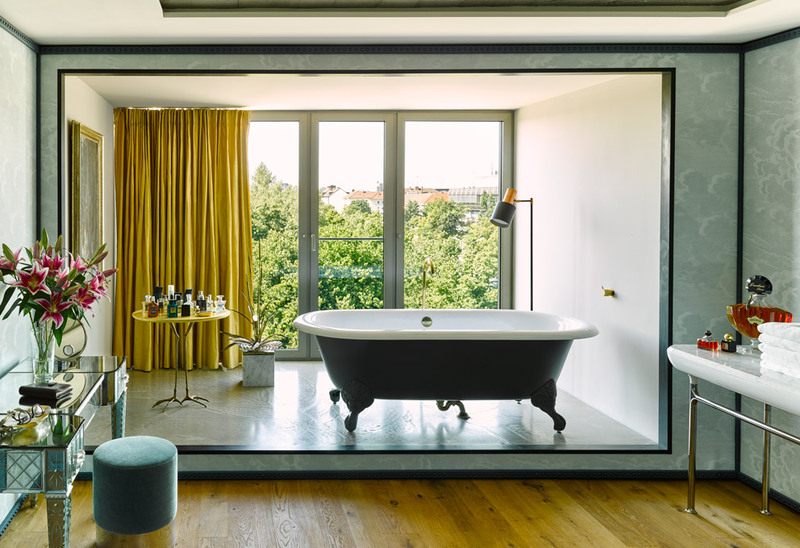 In the bathroom not only the tub by Drummonds, but also the small vintage table by Meret Oppenheim and Simon Gavina stands on claws. The washstand (right) was designed by Jaime Hayon for Bisazza, the mirrored unit opposite (with velvet stool by Azucena) was made in Murano. 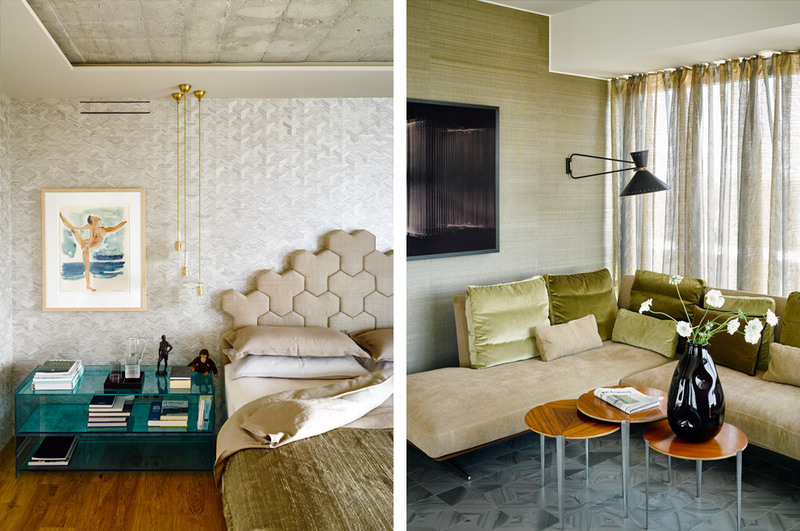 Fittings by Vola, Fornasetti wallpaper by Cole & Son, hand-trimmed silk curtain by Hoyer & Kast. Games of light and shadow: From the rooftop terrace you can look out at either Munich postcard motifs or plenty of greenery. The rope chairs by Fenny G were discovered at the Paris furniture fair, the modular lounger behind the fireplace was tailor made.